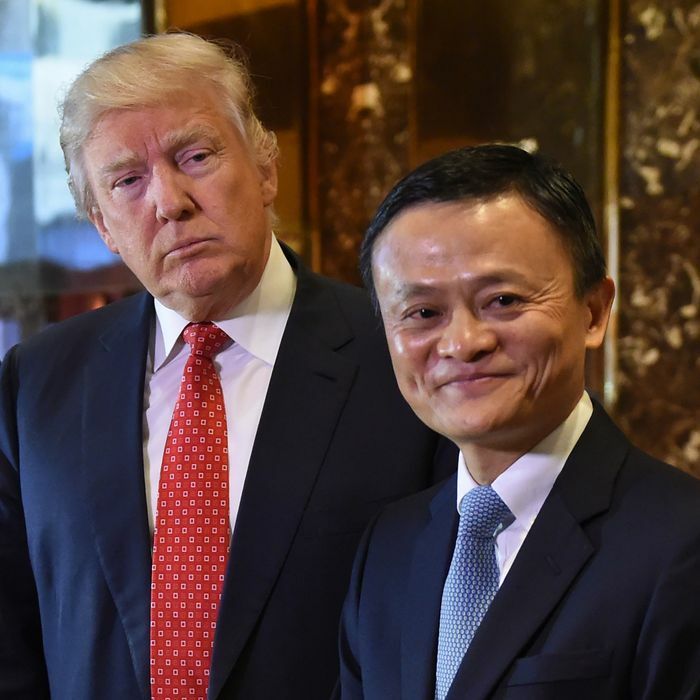 On Monday, Donald Trump met with Alibaba founder Jack Ma to discuss the company’s plan to create 1 million U.S. jobs over the next five years. Or, at least, that’s how the company’s spokespeople — and incoming press secretary Sean Spicer — characterized the meeting. And it truly would represent a “job boom” if the Chinese e-commerce company added 1 million full-time American workers to its current (global) labor force of 36,450. Especially since Amazon — Alibaba’s American competitor — employs less than 300,000 people. But Alibaba is not actually proposing an exponential increase in its own payroll — rather, the company claims that it will create 1 million jobs in the United States by enabling American small businesses to sell their wares to the Chinese middle class. Which is to say: It is promising to spur the U.S. economy by increasing trade with China. “Alibaba will create 1 million US jobs by enabling 1 million American small businesses and farmers to sell American goods to China and Asian consumers on the Alibaba platform,” the company said in a statement. In this context, Trump’s embrace of a company that aims to help U.S. exporters capitalize on America’s trade relationship with China may be a source of comfort: Better for the president-elect to flip-flop on trade with the Chinese then to start a war over it. But the Trump-Ma meeting is less comforting when viewed in the context of the president-elect’s habit of making misleading claims about job creation. In December, Trump met with Japanese billionaire Masayoshi Son. Following that meeting, Son informed reporters that his company, SoftBank, would invest $50 billion into the U.S., thereby creating 50,000 new American jobs. Trump claimed that such an investment never would have happened had he not been elected. But Son had already pledged to invest at least $25 billion into the United States in October of last year. It’s possible that Trump inspired Son to double his investment. But it’s also possible that Son merely allowed Trump to spin a preexisting expansion plan as he saw fit, in a bid to curry favor with the incoming administration. A growing list of companies — including Dow Chemical, Carrier and IBM — have sought to give Trump the credit he seeks for job or investment announcements, hoping their concessions can win them seats at the table as Trump begins crafting policies in health care, education, financial services and technology … Some of the business pledges are recycled news, and others amount to little more than public-relations messaging that will be hard to track to see whether promises are realized — but analysts see it as an emerging way for investors and executives to stay on Trump’s good side. On Monday, Ma helped Trump’s press secretary spread the (fake) news that the president-elect had just inspired Alibaba to create 1 million new jobs in the United States. In actuality, Ma declared his intention to facilitate American job growth by helping exporters market to the Chinese consumer class in a Wall Street Journal op-ed published in June 2015. But Ma has plenty of incentive to provide Trump with a flattering headline. Alibaba’s accounting practices have been probed by the U.S. Securities and Exchange Commission, and in December, American trade officials placed its platform, Taobao, onto a blacklist of markets that facilitate the sale of counterfeit goods. A friend in the White House could do much to alleviate such headaches. As it happens, Trump’s pick for SEC chair advised Alibaba on its initial public offering.